Life is full of distractions, making getting the work you need to complete in the time you have, tricky. It can be much more enjoyable to chat with your work colleagues about the latest "must-see" show on Netflix or sharing your #selfielive on Instagram. You'd agree time is in short supply, and it is not possible for you to buy more. I have a question for you. If I could show you how to regain around 43 minutes per day, what would you do with these minutes? I know I would spend this time with the people I love. Would you? So, how did I recover 43 minutes? I noticed I was spending a lot of time searching through folders for files that I needed to work with; this was taking a lot of time per day. I bet you are doing the same, clicking through layers of folders to get to a spreadsheet you word on last week, only to find a colleague has moved it. You'll know that as a director of Kimbley IT and our passion for G Suite this is my go-to productivity tool. Recently Google added Priority to Google Drive. This new feature for Google Drive has been a Godsend! Using AI Priority dishes out the files, it believes I will need access to as soon as I load up Google Drive. I no longer have to search through Team Drives and folders to get to the files I want, the files are magically there, and with one click I am away and editing them, helping me to stay focused. So, with this in mind, here are my five reasons why you should use Priority, its been saving me 43 minutes per day and hopefully the same for you. 1. 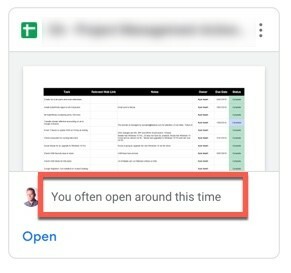 When you first load up Priority in Google Drive it lists the files it thinks you will need to access, these could be files you have recently been working on, it could be files you regularly access on a Tuesday, it could be files that you are collaborating with someone else and there are changes for you to review. Now I no longer need to search for these files; they are there waiting for me to open them. I have calculated this saved me around 10 minutes. 2. Priority will suggest files to you that you are collaborating on with a colleague or client, no matter if the file is located in your private My Drive area or shared out with a team in the Team Drives area. Priority will show a file that has recently been updated by someone else, I no longer have to email or message a collaborator to see if they have made changes and request they email the changes to me; I can see instantly they have updated the document, and I can with one click review the changes, saving me around 3 minutes. 3. This feature is super cool! Priority works out based on the date and the time, what files I usually access. It could be that on a Wednesday at 3 pm I typically check a spreadsheet documenting financial details, Priority knows this, and it will suggest that spreadsheet to me! Saving me around another 5 minutes. 4. 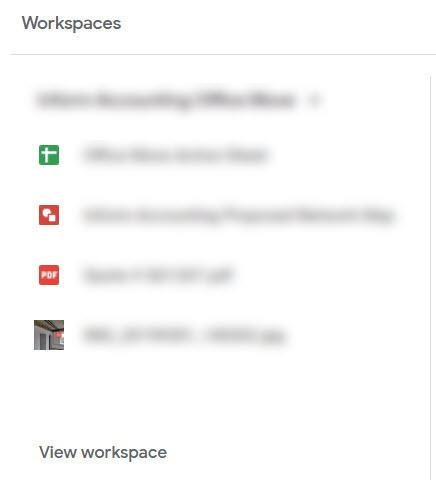 Along with Priority on the same interface, Google introduced Workspaces. Workspaces let me group documents together from different locations - so I can quickly access them. Recently, I was involved in an office move for one of our clients as you can imagine there were lots of documents, checklists, spreadsheets, legal documentation, etc. These files are located in different locations. Some saved in my companies Google Drive, some in the clients Google Drive. In the past, it would have been a nightmare to find these files each time an alteration was needed. Workspaces saved me from this nightmare, it allowed me to create a Workspace in Google Drive where I could add all these files, so I would never need to search for them again. During the process of creating the Workspace, the AI even suggested some related files I should include that I have missed! In the future, I will also be able to share out the Workspace I have created with colleagues so that we can all sing from the same hymn sheet. In all Workspace save me at least 30 minutes. Priority is a fantastic example of modern working. Time is precious, and it shouldn't get wasted on mundane tasks. Life moves fast. With Priority you can spend less time working and more time with the people you love. I spend my spare time with my two girls Dixie Dee and Shiloh Skye, and nothing is more important. Working with G Suite and Priority enables me to make sure I make the most of the time I spend working so that I can enjoy the time with the people I love the most.